Fluorescence is a molecular phenomenon in which a substance radiates light energy almost instantaneously upon being struck with light from another source. Some energy from this incident light is absorbed by this substance, meaning that the radiated light is typically of lower energy (and thus longer wavelength) than that of the source. The process of light absorption and radiation is known as excitation and emission. Fluorescence is exhibited by most organic and non-organic substances and in the early days of fluorescence microscopy (at the turn of the century) microscopists looked at this natural, primary fluorescence, called autofluorescence. The utilization of fluorescence as an imaging modality has become an invaluable tool for researchers, particularly those in the biological and material science fields, studying substances which were previously ‘invisible’ under other forms of microscopy. Biologists can, as mentioned above, stain very specific sub-cellular components with fluorescent molecules, allowing them to highlight their location in the cell and study potential molecular interactions at very high resolutions. The image in figure 3, for example, was made by utilizing optical filters to image the conjugation of three different fluorochromes to three different cellular targets. 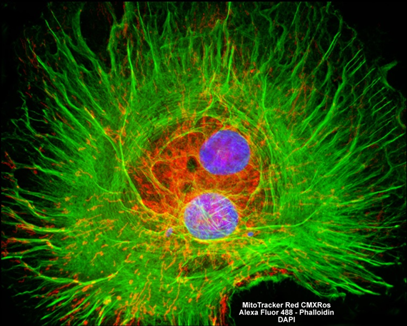 In this image, MitoTracker Red, Alexa Fluor 488 and DAPI are conjugated to the cell's mitochondria, actin filaments, and nuclei, respectively.